For other accesses, please refer to the link below. 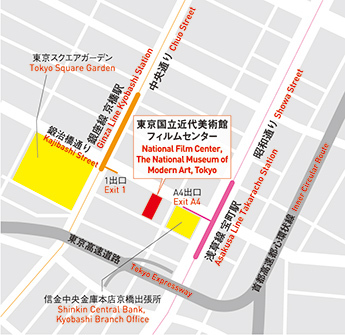 Access by car　* Tickets for Tokyo International Film Festival will not be eligible for parking ticket validation services offered by Roppongi Hills. Stops inside Roppongi Hills at the Grand Hyatt Tokyo. 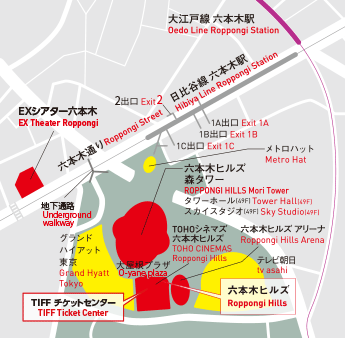 Roppongi Hills provides a guide to cover facilities and services for customers with infants, as well as for elderly and phosically challenged customers. 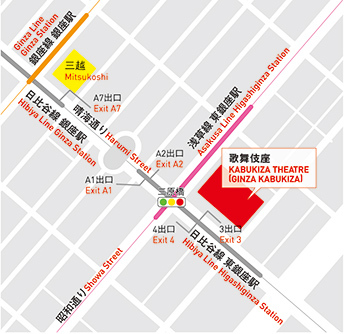 Roppongi Hills provide wheelchair rental services at General Information (HILLSIDE 2F (Mori Tower 2F)). Please present photo ID (Driving License / Passport etc.) when applying. For wheelchair users and visually impaired people, handrails, mirrors and braille labels are installed in elevetors. * Some elevetors don't have braille labels. The escalator connectiong West Walk 2F (South Side) and Roppongi Keyakizaka Dori can be used while a passenger is sitting on the wheelchair. When you use it, please call an attendant by pushing the button beside the escalator. Space for wheelchairs is available in all 9 cinemas. For details, please call the number below. *Space for wheelchairs is available.